Based on the 1993 book by author Robert O’Connor, director Gregor Jordan’s Buffalo Soldiers seemed to be the latest cinematic entry in the darkly comical military films from the tradition of Dr. Strangelove, M*A*S*H, Catch 22 and Three Kings but two days after its debut at the Toronto Film Festival, an event occurred that would forever alter viewer’s perception in the form of 9/11. Shelved more than two years until a rerelease at Sundance where infamously an angry woman thrust a bottle of water at the cast in her disgust at what she perceived was Anti-American sentiment, there was a question of whether contemporary America would ever be ready for Buffalo Soldiers. However, in my recent viewing six years after its '01 premiere and when our country is involved in two wars, I can finally see it for what it is—an entertaining and compelling film and not at all the “evil” piece of propaganda that it’s been labeled in the past for as critic James Berardinelli wrote in his review, the film’s “viewership should not be diminished by the unfortunate and inaccurate ‘Anti-American’ label.” In fact, as of this writing, the film has a 70% fresh rating on Rotten Tomatoes. 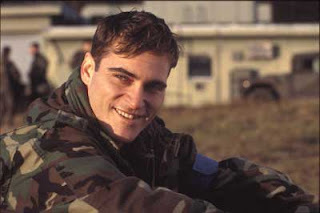 Featuring another great, charismatic and offbeat turn by Joaquin Phoenix (one of the most exciting chameleon actors of his generation), the film chronicles the exploits of Ray Elwood (Phoenix) who is persuaded to enlist in the army after getting into trouble with the law and ends up stationed at the Theodore Roosevelt Army Base outside of Stuttgart in West Berlin, 1989 just before the wall is going to fall. Using his experience as a criminal, Elwood works by day as the battalion secretary for his dim-witted but teddy bear of a commander Colonel Berman (Ed Harris) and sells anything he can get his hands on in the black-market. When he isn’t rerouting government requisitioned Mop ‘N Glo to the locals, Elwood has yet another job as a heroin cook for the intimidating Military Police who dominate the base but he begins to find himself jeopardized by first finding five million dollars worth of stolen arms and secondly, by the arrival of rough, tough Vietnam vet Sgt. Lee (Scott Glenn) who arrives on base to weed out crooks like Elwood. Lee’s methods go from offensive to defensive when Elwood begins dating his free-spirited young daughter Robyn (Anna Paquin) and in order to punish the soldier Lee uses his Mercedes as a target practice for the squad. Being the girl in a military film is never easy but mature Paquin dives right into it headfirst, the same way her character Robyn dazzles Elwood in her dives from the highest board above the army pool on the base. Although it’s hard to empathize with a character who is as scheming and dishonest as Elwood, we’re completely engrossed in the wickedly funny storyline. In fact we're so hooked that we stay tuned even as things get progressively more distressing and harder to believe thanks largely in part by the subtle direction and sharp performances by our leads with an especially impressive counter-balanced dynamic of Elwood’s two opposing male authority figures Harris and Glenn whose radical differences recall the Berenger and Dafoe characters in Platoon. Despite its cynical approach, the film is one that comes from a long line of these intriguingly different looks at the armed forces and director Jordan (much like the book’s author O’Connor) respects the intelligence of his audience enough to trust that they’ll realize it’s satirical and one of the better M*A*S*H like military comedies of the new generation… that is, if viewers take the time to seek it out with an open mind.